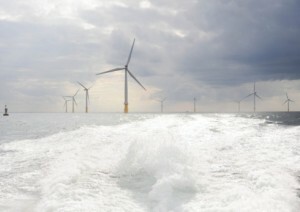 Since their construction, the eighty-eight wind turbines of Sheringham ShoalA sandbank or sandbar that makes the water shallow windfarm off the North Norfolk Coast have come under fire from critics, some of them claiming that their views from Blakeney Point have been spoilt and others that they would inhibit the fishing and wildlife of the area. But many approve, not least the fisherman who have long known that fish congregate around the wind farm bases. Now the seals have discovered this also. Wind farm bases sit on the ocean floor to form artificial reefs that attract crustaceans and other invertebrates as well as fish. This lures both grey seals and harbour seals to come to such areas for food. Marine biologists are keeping a close eye on this whilst continuing to carry out their research on these structures to find out just how they will affect the environment. At this time they are studying and tracking two groups of seals at two different wind farms, one being the Sheringham ShoalA sandbank or sandbar that makes the water shallow and the other the Alpha Ventus windfarm off the German coast. Employing GPS technology for tracking, researcher Deborah Russell from the University of St Andrews in Scotland was surprised to find that the seals moved from turbine to turbine in a direct straight line, obviously looking for prey, then stopping at certain spots where it was found to be abundant.